Looking for those fast-fashion styles that are easy on the pocket as well? Step into the People store and discover cool, in-trend styles that you can show off for your next night out or college fests. Catering more to the millennials and them fashion-conscious youth, the store has a varied collection of international styles. Call it a one-stop destination or easy-on-the-pocket store, everything in the store caters to women, men, and even kids. Yes, little tykes and princesses can all dress cool when they shop from here. The store’s latest trends, the one that appeals to the millennial crowd, is what we would call street-smart or college-ready casuals. 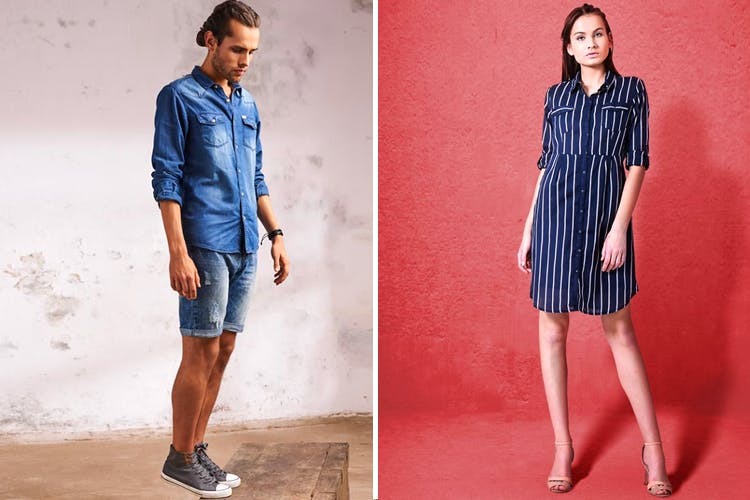 Casual shirts, t-shirts, tops, kurtas and fusions tops, jeans, winter wear and accessories are what you can score here and with them constantly updating their collection, you are bound to get new stuff every time you check out the store. In case you are feeling lazy to step and visit People’s stores across Bangalore, you can always shop online from their website as well. There’s plenty for the office goers, wanderers, and fam-jams. Men could score everything from a plain white tee to jogger pants, while the collection for the women varies from something as simple as a kurta to a fusion top that can be paired with either palazzos or slim-fit jeans. If you are asking about the price range and stuff, we can tell you that the men’s bottom wear collection start from as low as INR 900 and can go all the way up to INR 2,000. It’s the same price range for ladies as well. Top wear for men start from as low as INR 250 and goes all the way up to INR 4,000, thought the high price range is because we have included blazers, jackets and the likes that cost INR 2,000 and upward. The price range for women is similar to that of the men’s with tank tops and the likes starting at INR 250 and above. Accessories and footwear for men and women start from INR 900 and above. The footwear for men and women feature contemporary styles, so if you come across something that looks like a Converse or a Vans, feel happy to score then for less than half the price for branded ones. While we are not fashionistas, we can tell you that the collection is lit enough to be in your wardrobe.